What happens if three highly talented musicians and best buddies share the same huge passion for music? They jam together and the result is…STEALING AXION. This tasteful homebrew was born three years ago in the cold winter roaming the region Pacific Northwest of the north-western North America. With hard work and dedication they have slowly progressed from a few simple songs to a collection of complex ones, which were self-recorded and released as an EP in 2010. Now it’s finally time to be feeding our ears with the delicious candies from the full length debut release entitled “Moments”, and to my and many others big surprise this quintet is fully armed and ready to chop of some metalheads with their 7/8-strings axes. The foundation of the so called djent scene was build many years ago mainly by the legendary prog metallers from Sweden named Meshuggah, and bands like TesseracT, Textures, Uneven Structures and Periphery have added their own building blocks of innovative complex sounds to the already well known polymetered playground. So, is there enough space among these pioneers for “Stealing Axion” to add their own unique distinct sound, which will make them stand out? Without hesitation, my answer is definitely…YES. These four American dudes with long greasy hair and a high level of musicianship, have loaded up their guns with heavy powder made of a dangerous explosive cocktail. The ingredients included are grooving staccato rhythms, brutal and low tuned guitar riffs, mellow passages and ambient soundscapes. This is djent of the highest order. On board we will find a total of three vocalists the frontman Daniel Forbrich (screams & growls), Josh DeShazo (clean & screams), and Phil Willmarth (backup vocals with a few lead pieces here and there). The only member from this prog group not contributing with any vocal duties at all is the drum machine Blake Ferris. But let’s face it, which prog metal act needs more than three singer’s right? With a trio it can become an utterly mess, but these singers are all skilled vocalists, and the result is an ambient, eerie and atmospheric vocal experience with a very unique blend of different singing styles. Dan, Josh and Phil are also very gifted instrumentalists, and so the aggressive low tuned guitar riffs are delivered with almost perfect execution by Dan and Josh, and Phil is left alone with showing of some impressive bass moves. “Stealing Axion” will embark our minds on a 76 minute dark musical journey, through eleven songs, telling a story about a man that has predicted the world coming to an end, and who becomes out casted from the society. With that concept in mind let’s unwrap the goodie bag, and have a proper chunk of the opening song ‘Mirage of Hope’. When your teeth meet the first pieces of delicious metal, your mouth will be watering, and your mind will be screaming for more. What will be exploding inside your mouth are layers of ambient sounds of pure epicness with the clean vox and screams mixed on top and side by side with fast polyrhythms down tuned riffs. Second song ‘Solar’ continues walking the same path with more of the same groovy catchy patterns. It’s fully complemented with a delightful mix of soaring clean vocals and harsh deep growls, and is the first of many highlights found on this release. Third song ‘Everything or Nothing’ is another groovy song with growling parts by the harsh pipes of Dan and clean vox by Josh, both of them again performing almost spotless. And so we continue our travel through the next songs, each of them providing something very unique and distinct, until our journey ends with a “big bang” with the title song/songs ‘Moments’, It’s an epic epos with a playing time of almost 23 minutes, if it wasn’t fragmented into two pieces, and showcases the overall artistic expression that has surrounded our minds throughout the tracklist, and it finishes perfectly the entire album. Guitarist and producer Acle Kahney from TesseracT has offered his expertise and support to this group and with his seal of approval, our minds can rest assured that a vein of gold has been discovered. All the crispy instrumental details are perfectly cut out in the ambient soundscape, and Acle has with his talents as the wizard on the mixing and mastering buttons, polished the high quality craftsmanship created by the quintet. 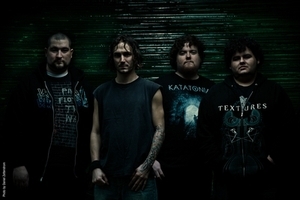 These are the newfound kings of the “djent” throne and progressive groove metal has a new name, pronounced “STEALING AXION”. This is as important as the universe itself, and hands down…my metalbrain has experienced some of the most intense and breathtaking eleven epic 'MOMENTS' in my yet short life as a metal reviewer. I’m on my knees. They have seduced my mind, and I’m begging them to hear my last wish…I DEMAND MORE! And finally the great metal gods have listened to my prayers. 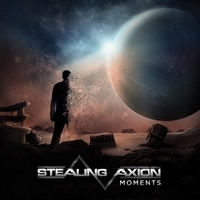 Soon the wait will be over, and “Stealing Axion” will be touring and tearing up stages in the beautiful landscapes of Europe.